Yorkshire homebuilder Avant Homes is on course to secure planning approval for a 220 house scheme at Waverley in Rotherham. Avant exchanged contracts with owners Harworth Group plc for a 14.06-acre site and submitted a planning application to build a mix of 220 three and four-bedroom properties, alongside the 61 family homes that are currently under construction at its Sorby Row development. They are part of four new sites with a combined value of £101m that will bring a total of 382 homes to the Sheffield city region once completed. 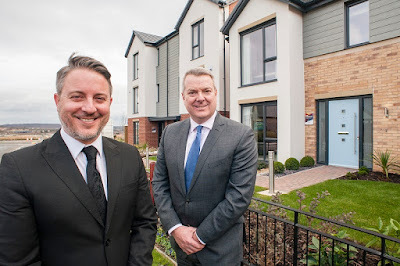 Rob Slocombe, managing director at Avant Homes Yorkshire (pictured, right), said: "We are on a fast-moving upwards trajectory and the south of the region is a key focus for us. The last 12 months have seen high demand for our product here and the decision to purchase further land at Waverley demonstrates our dedication to investing in Sheffield, Rotherham and beyond. "We are entirely committed to offering a product that meets the ever-changing needs of our customers' and this development will give buyers the opportunity to purchase a high-specification new home quite unlike those offered by our competitors. "Keen interest is already being shown in the proposed scheme and we are taking enquiries in readiness for the launch of the new development." Land owner and developer, Harworth Group plc, secured planning permission for Yorkshire's largest brownfield redevelopment, which includes a new community of up to 3,890 homes. Duncan Armstrong-Payne, associate director of major projects at Harworth (pictured, left), said: "Avant's decision to further invest in Waverley is yet more evidence of the development going from strength to strength. I've been delighted by the quality of homes that Avant has delivered at Sorby Row and I look forward to their next phase of housebuilding in 2018." At the next meeting of the planning board at Rotherham Council, members are being recommended to approve Avant's latest plans for Waverley. Located to the north and east of previous phases of development by Harron and Barratt Homes which are nearing completion, the application seeks permission for 220 residential units consisting of a mixture of two bedroom apartments three, four and five bedroom dwellings which are two and three storeys in height. 17.7% affordable housing is to be provided which equates to 39 units - 18 of the two bed apartments and 21 three bed dwellings. A number of objections from residents focus on the size and location of the apartments, car parking and open space. A report to the planning board concludes: "It is considered that the layout and design of the proposed development offers an acceptable balance between achieving an efficient use of the land available whilst safeguarding a satisfactory provision of individual private amenity space for each dwelling." Avant, the housebuilder formerly known as Gladedale Group, posted both record revenue and operating profit numbers for the financial year to April 30 2017. Revenues increased 45% year-on-year to £369m, whilst operating profits rose 107% to £45m.